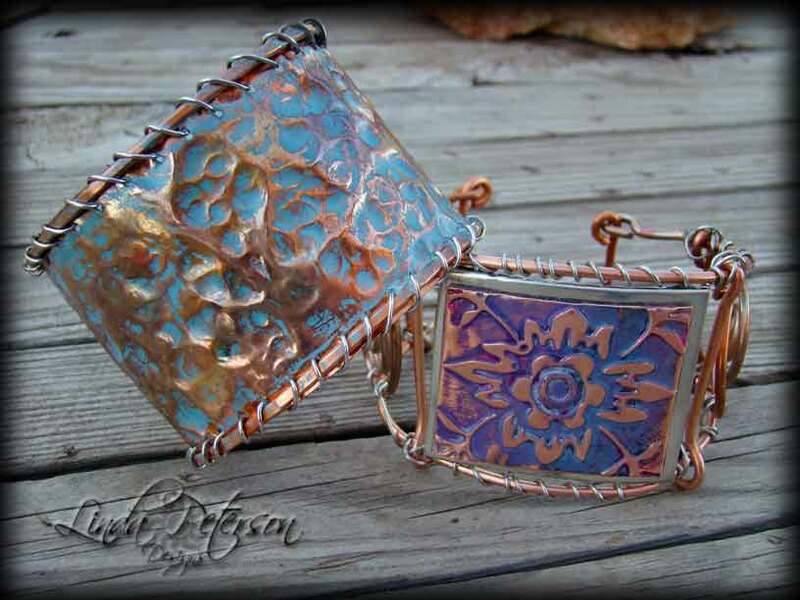 Learn how to create a lovely copper cuff bracelet with a hammered texture. Artfully manipulate the color of the copper and secure with silver wire to the copper rods. This bracelet from AMACO uses many of the same techniques as the Copper Wire Cuff Bracelet (pictured at right bottom). Adjust the measurements accordingly to fit your wrist size. Apply heat with heat gun to change colors of the copper. Allow to cool. Apply double stick tape to one side of copper strip and tape both pieces together. Trace pattern onto copper using stylus and cut out. File edges to smooth if necessary. Punch holes every 1/4” around cuff. Hammer with ball side to texturize. Secure rods to side of cuff using silver wire and overcast stitch. Trim excess wire as necessary and file end smooth. Repeat for other side. Apply Rub-N-Buff® as desired. Buff with soft cloth leaving patina into impressions. Gently curl cuff to wrist shape.